Dr. Richard L. O’Bryant is director of the John D. O’Bryant African American Institute at Northeastern University – named in remembrance of his dad. At the John D. O’Bryant African American Institute Dr. O’Bryant oversees educational and cultural programs, services and activities focused on African American students. 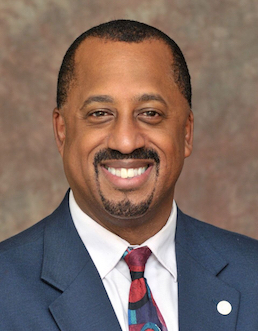 Under his vision and leadership, the John D. O’Bryant African American Institute has become more engaged with many aspects of Northeastern University including academic components, community outreach efforts, connecting with the NU Black alumni and the enhancement of the breadth and depth of programs and services offered. In the fall of 2018 Dr. O’Bryant and the Institute hosted the 50th Anniversary Celebration of the founding of the John D. O’Bryant African American Institute in 1968. Hundreds of participants including students, alumni, faculty, staff and members of the Boston community came together to celebrate the Institute’s rich history and highlight and dialogue about the future. Dr. O'Bryant is also a lecturer in the Department of Political Science, the School of Public Policy and Urban Affairs and the College of Professional Studies. Dr. O’Bryant also has several publications. His publicationsinclude an anthology co-edited by O’Bryant and Barreto entitled “American Identity in the Age of Obama” (2013), a book chapterICT as a Public Good: Community Building and Expanding U.S. Self-Sufficiency Policypublished in “Creative Regions: Harnessing Urban Technologies to Support Knowledge City Initiatives (2008),”a monograph Low-Income Communities: Technological Strategies for NurturingCommunity, Empowerment and Self-Sufficiency at a Low-Income Housing Developmentpublished in 2005 in the W.K. Kellogg Foundation’s National Forum on MultidisciplinaryPerspectives on Higher Education for the Public Good, and a review of Media Access: Socialand Psychological Dimensionsof a New Technology Use, published in February 2005 in the New Media and Society Journal and a book chapter Walking in the Wake: A Father’s Legacy and a Son’s Pridepublished in “Our Stories: The Experience of Black Professionals on Predominantly White Campuses” (2002). An aspect of Dr. O’Bryant’s vision is to establish the John D. O’Bryant African American Institute as a national model for an African American cultural center and Institute. Dr. O’Bryant has professional memberships and organizational affiliations with national organizations such as the John D. O’Bryant Think Tank (JDOTT) for Black Professionals in Higher Education and the Association for Black Culture Centers (ABCC). Dr. O’Bryant’s professional experience also includes serving as a senior software engineer at Digital Equipment Corporation (now HP-Compaq). He was one of five recipients of the 2002-2003 National Rising Scholars Award to Advance Research on Higher Education for the Public Good. Courses Dr. O’Bryant teaches include Developing your Leadership Capabilities (grad), Techniques in Policy Analysis (grad), Contemporary Community Development (grad), Urban Government and Politics (grad), Science, Technology and Public Policy (undergrad), Economic Institutions and Analysis (grad), Urban Government and Politics Syllabus (grad), Current Issues in Cities and Suburbs (grad), Contemporary Community Development (grad) Techniques in Policy Analysis (grad). He is a long-time member of the Concerned Black Men of Massachusetts, a volunteer organization that works with young black males on positive self-development. In 1997 and 1998 Dr. O’Bryant served as a fellow in MIT's renowned Community Fellows Program. He received his undergraduate degree in computer systems engineering from Howard University and a Ph.D. in urban and regional studies from MIT in 2004. Dr. O’Bryant resides in Boston Massachusetts and is married to Lanice and they have three sons, JohnRichard, JohnMichael and Greg.